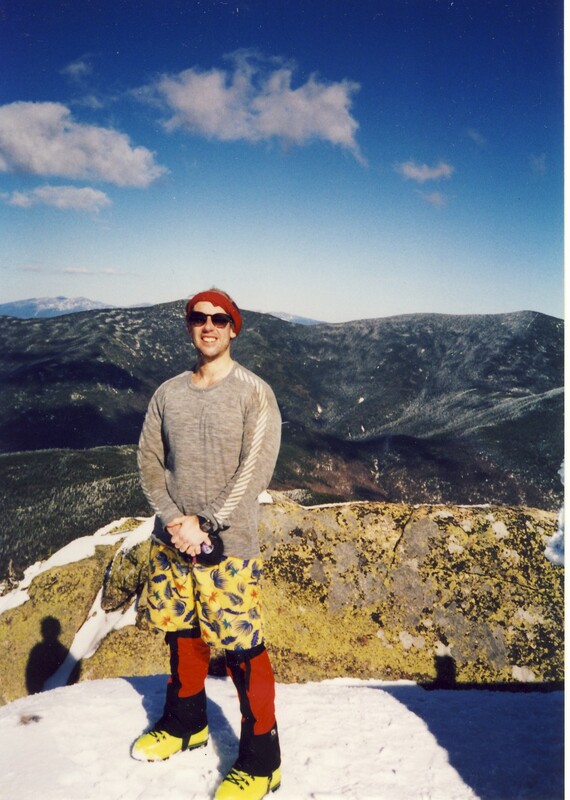 Posted by Jenny in hiking, White Mountains. 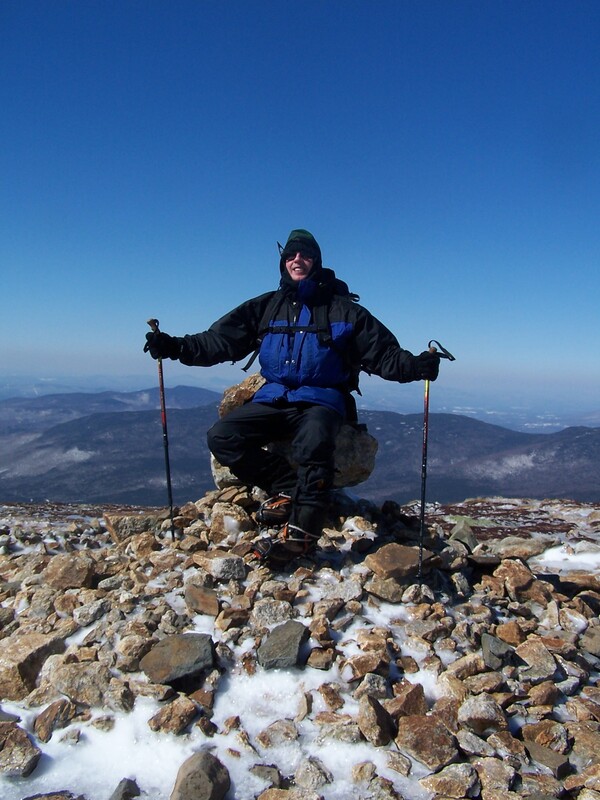 On January 5, 2008, Bob and I reached the summit of Mt. Monroe. Hurray!—or so we said to ourselves at the time. That was the 48th and final 4000 footer that we had climbed in winter, which is strictly defined by the AMC Four Thousand Footer Committee as the period between the winter solstice and the spring equinox. It wasn’t until last fall that we got around to sending in the paperwork in which you list each climb with the date and a few comments. So all through this winter, I kept saying to Bob, “Hey, maybe we ought to go climb Eisenhower,” and then either the weather would be bad, or he would want to going XC skiing instead, or something…we planned it for President’s Day weekend, but he was recovering from a bad cold and I was getting the first twinges and sneezes that showed that the cold was soon to be mine. So it all came down to this weekend. The weather had to be decent…and it was! We went up the Crawford Path past Mt. Pierce, and on to Eisenhower. 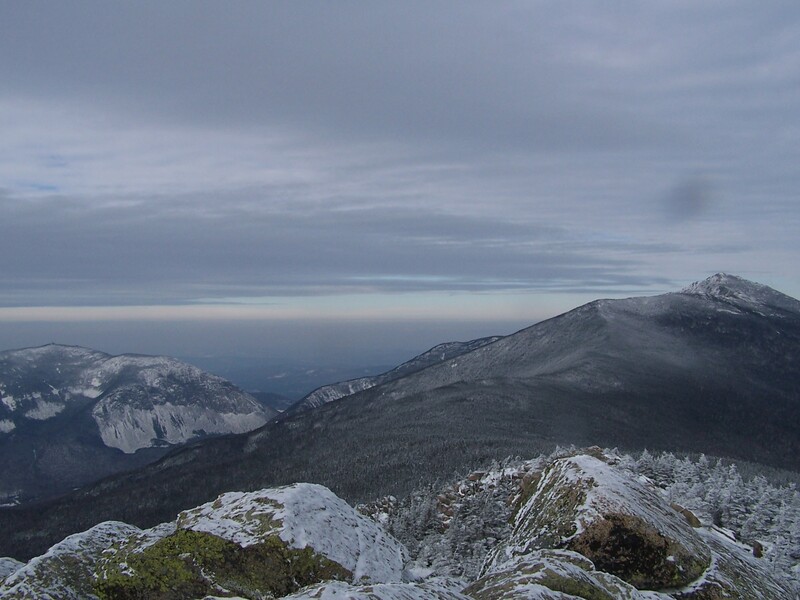 A beautiful sunny day, temps probably in the upper teens up on the ridge, winds in the 40 mph range. We used face protection when heading into the wind, but much of the time we enjoyed the reflected warmth off the bright sunny snow. Above treeline the conditions were a combination of thin snow and ice, and crampons were the weapon of choice. Back into the realm of the mountain gods! I know everyone visiting my blog has been scratching his or her head and wondering, “When is Jenny going to get a scanner?” Well, it has finally happened. Don’t get your hopes up too much, though—I’ve never been much of a photographer, and many exciting and wonderful adventures went unrecorded. But I’ll be updating some of my old posts with a few pix! 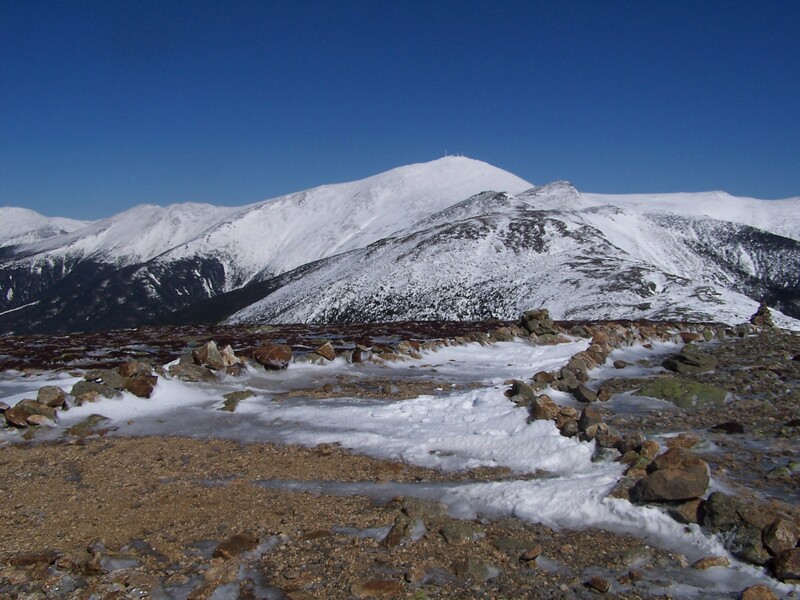 The band of eight set off from the summit of West Bond, not retracing their steps along the spur trail but continuing west along the ridge, bushwhacking into deep, unconsolidated snow with no crust. As Mohamed described it, “Progress was slow along the ridge, and remained slow after we dropped off its end, even though we were following a bearing which had led to an easy descent on a previous winter attempt. After about five hours we had only lost about 500 vertical feet, were still in dense spruce, and appeared surrounded by spruce traps.” And of those five hours, they had been bushwhacking in the dark with headlamps for about four. For those who have never had the experience, a spruce trap is a good-sized pocket of air in deep snow formed by the wind patterns and drifting of snow around branches of scrub spruce or fir. It looks solid on top, but as soon as the hapless snowshoer steps onto it, the thin snow layer on top collapses and the snowshoer falls into a deep pit, sometimes over head height. It can be extremely hard to get out of, especially since the snowshoes themselves tend to get stuck against the edges of the pit. The upper slopes of West Bond, being girdled with gnarly scrub, are perfect spruce trap territory. So they decided to follow their deep tracks back to the top of West Bond and then take the trail back out. It took them two and a half hours to get back to the summit, which they reached around 11:00. They stopped for a rest at the Bond/West Bond col, and there decided to hike slowly out through the night rather than bivouac. They were able to make cell phone contact with their spouses and friends. And so they continued on through the night, stopping frequently to rest. The last two members of the group made it out at 8:00 the next morning. Mohamed’s account gives a full analysis of the decisions that were made and the lessons to be drawn. To me, the most interesting question is whether it’s possibly to recognize quickly in winter conditions when it just doesn’t make sense to bushwhack. I have done a bit of winter bushwhacking myself. One time in March 1995 Bob and I climbed Garfield by a bushwhack approach just for the fun of it, following a tributary of the North Branch of the Gale River. That was certainly a nutty thing to do, since we could easily have followed trails the whole way, but we experienced a beautiful sparkling white stream valley that led us past frozen waterfalls and canyon walls cushioned with snow, a place where not many people have ever set foot. Bob and I did go back and get the Bonds on March 11, 2006. It took us about 15 hours. We skied in as far as the Bondcliff trail junction. The weather was good, but the wind did knock me off my feet twice as I cramponed across smooth ice between Bondcliff and Bond. For me, the skiing back out was very difficult. I was very tired by that point, and it was past sunset, and with my heavy pack my balance was poor and I fell down a lot. But we made it.